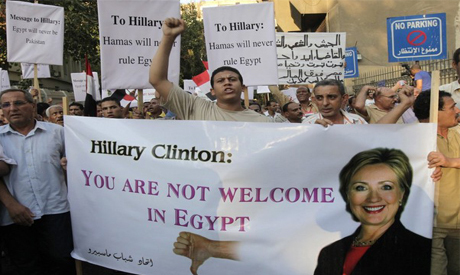 Protesters threw tomatoes and shoes at Secretary of State Hillary Clinton’s motorcade on Sunday during her first visit to Egypt since the election of Islamist President Mohamed Mursi. A tomato struck an Egyptian official in the face, and shoes and a water bottle landed near the armored cars carrying Clinton’s delegation in the port city of Alexandria. A senior state department official said that neither Clinton nor her vehicle, which were around the corner from the incident, were struck by any of the projectiles. Protesters chanted: “Monica, Monica”, a reference to Former President Bill Clinton’s extra-marital affair. Some chanted: “leave, Clinton”, Egyptian security officials said. It was not clear who the protesters were or what political affiliations they had. Protesters outside Clinton’s hotel on Saturday night chanted anti-Islamist slogans, accusing the United States of backing the Muslim Brotherhood’s rise to power. The assault on her motorcade came on a day Clinton spoke at the newly re-opened U.S. consulate in Alexandria, addressing accusations the United States, which had long supported former President Hosni Mubarak, of backing one faction or another in Egypt following his ouster last year. A State Department official from Clinton’s entourage allowed two journalists to ask questions. Both had accompanied Clinton from Washington. The two Egyptian journalists allowed to ask questions were from state television, known for their pro-military bias. TRN’s repeated attempts to ask a question were ignored. This missing link to Hillary’s reception. In the Zionist entity, Hillary faced the angry Jewish protestor who demanded the release of Jonathan Pollard who is serving a life sentence in the US for espionage for Israel. The protester’s demands in support of Pollard were heard during her meeting with Israel’s Foreign Minister Avigdor Liberman.